Veritas: Last-minute trip to Riksgränsen! This morning I booked a last minute trip to Riksgränsen. I'll fly up there with Åsa, Patric, and maybe one of Åsa's friends. 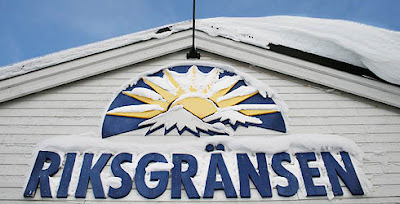 The name Riksgränsen means, literally, The Kingdom's Border, and the name is apt. Riksgränsen lies just next to the border with Norway, in the Northwesternmost part of Sweden. This will be my first trip to a part of the world North of the Arctic Circle. It shouldn't be too cold though; Sweden is having unseasonably warm weather these days, and the travel agent informed us that its -5 °C and sunny up there right now. I'm lookin forward to a few days of excellent skiing too. There's supposedly a lot of fresh powder on the slopes. The best part is that we got the trip for a steal of a price: 995 SEK per person paid for airfare and accomodation for three nights! I'll take photos but I doubt I'll be able to post any before I return Sunday night.